Two teams of divers from the National University of Singapore (NUS) collected more than 100 kilograms (about 220lb) of trash from the water surrounding Singapore’s first marine park to mark this year’s World Oceans Day, and International Year of the Reef. Led by Our Singapore Reefs co-founders Dr Toh Tai Chong, a lecturer at the College of Alice & Peter Tan at NUS, and Sam Shu Qin, a research assistant at the Tropical Marine Science Institute (TMSI) at NUS, the NUS divers conducted two dives each on June 10 at Sisters’ Islands Marine Park. Officially opened in July 2015, the 40 hectare (99 acre) marine park’s ecosystem is home to rare species of seahorses, clams, and other marine life, despite its close proximity to one of the world’s busiest sea ports. The 18 NUS divers collected more than 500 discarded items, including tyres, boat batteries, acrylic sheets, discarded fishing netting, and an anchor… with no boat attached, weighing a total of 126 kilograms (278lbs). Participating in an ocean clean-up drive for the first time TMSI research assistants Sim Wan Ting said she was surprised at how much floating plastic trash was in the water. “I realised that cleaning up the ocean can be really time consuming. It is more important that we reduce our trash’, she reportedly told NUS News. Established in 2017, Dr Toh and Ms Sam said told NUS News that they felt compelled to establish Our Singapore Reefs after seeing the amount of damage being done to Singapore’s underwater coral. The waters around the city-state are home to more than 250 different species of hard corals, about 32 per cent of the global total. With the support of business, community organisations, and government agencies the NUS Our Singapore Reefs community has seen more than 100 volunteer divers collectively remove more than 2,800 items weighing some 600 kilograms (1,323 lbs) from Singapore waters over the past year. 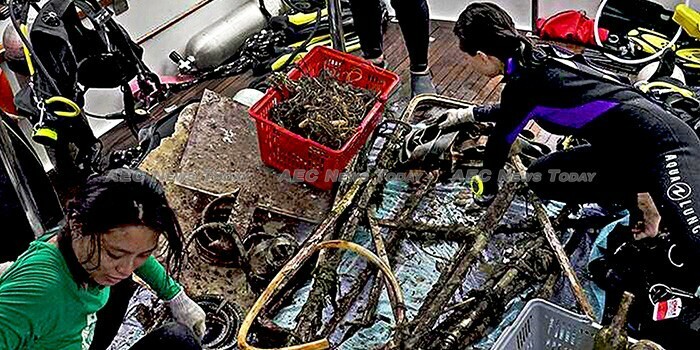 On June 8 to mark World Oceans Day the Maritime and Port Authority of Singapore (MPA) led a team of 20 volunteer divers to the water around Raffles Lighthouse where 110 kilograms (242 lbs) of plastic, glass bottles, and tyres were recovered. At the time MPA chief executive Andrew Tan described keeping Singapore’s waterways clean is a shared responsibility. “We can show the world that Singapore can be both a busy port as well as a marine environment rich in biodiversity”, The Straits Times reported. According to the US-based NGO Ocean Conservancy’s 2017 International Coastal Cleanup Report some 149,892 items of trash weighing 12,773 kilograms (28,159lbs) were pulled from Singapore water and beaches by 3,179 people on International Coastal Cleanup (ICC) day in 2016. 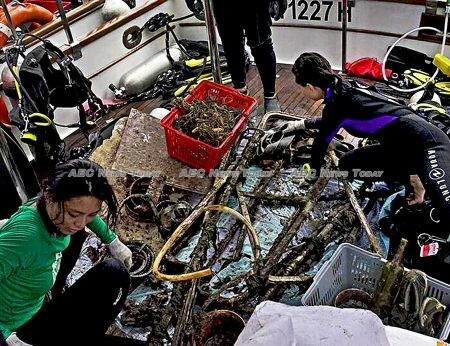 Meanwhile the NUS divers are planning another clean-up dive next month and on July 14 will clean a little more of the ocean floor surrounding Singapore. To compliment their underwater work the group conducts outreach and education programmes informing people about the impact of marine debris.